State house today – Pictures By Eddie Mwanaleza/State house. 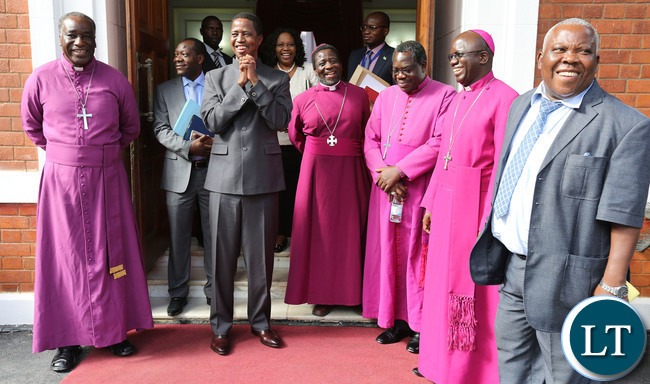 President Edgar Lungu today met Anglican Bishops led by Archbishop of the Anglican Bishop of Central African Albert Chama at state house in Lusaka in his effort to create unity in the nation. President Lungu who was clad in his normal slim fit suite blue in colour appealed to the Bishops to help his administration’s anti-tribalism campaign in the country. Mr. Lungu urged the clergy to help fight the scourge of tribalism which he said is being perpetrated by some traditional leaders in some parts of the country. The President urged the Anglican Bishops to take both spiritual and practical steps towards tribalism which he said can divide the country. He regretted the involvement of some traditional leaders in the propagation of divisive messages of tribalism. And in a closed door meeting, the Anglican Bishops and the President also discussed a wide range of issues ranging from the state of the nation regarding reconciliation, peace and stability. President Lungu’s Special Assistant for Press and Public Relations Amos Chanda told ZANIS after the meeting that the President took the opportunity of the meeting to discuss the situation regarding the mining on the Copperbelt. “The President took the opportunity to inform the Bishops that there is constant dialogue between his government and the mining companies. “He briefed them on the positive developments that are emerging in the mining industry particularly with regards to the dialogue that are going on between the ministry of mines, Ministry of finance and KCM and ZCCM on the other hand,” Mr. Chanda explained. Mr. Chanda said the President is confident that the steps that KCM has taken will result in the stabilization of the mine, reopening of Nchanga open pit mine and increase production. He said the president is very optimistic that his government will provide a conducive environment for the success of the mining industry in the country. And the Clergy have assured the President in their response that they will take steps to help spread messages of reconciliation, peace and unity in the country. Mr. Chanda told ZANIS that the Bishops have encouraged the president to continue to take all necessary steps to promote national dialogue, peace unity and dialogues across parties in the country. He said the Bishops wants the President to continue reaching out to all stakeholders within political and nonpolitical circles to promotes ‘one Zambia one nation’ motto. And the Bishops have commended the President for the leadership he has shown in controlling army worms that affected crops in various parts of the country. They have since reported to the head of state that in their various areas the situation regarding the attract on the crops by army worms are being controlled due to government’s efforts and have assured the President that the country is on course to regard a good yield. The delegation which was led by Archbishop of the Anglican Bishop of Central African Albert Chama who is also the Bishop of the Diocese of Northern Zambia included the Bishop of the Diocese of Central Zambia Derek Kamukwamba, Bishop of the Diocese of Eastern Zambia Bishop William Mchombo and Bishop of the Diocese of Lusaka, Bishop David Njovu. so stop firing hardworking bembas,lozis,tongas without reasons. We know the architect of this. These pf cowards, give us the names of of those chiefs, useless army worms. Did Edgar comfess his son, including involvement in swindling dull Malawians? He decided to invite Anglican Church which is more close to Malawian faith. Your so called religious christian leaders having CLOSED DOOR MEETINGS they all tell there is nothing to hide!! UPND I.D.I.O.T.S i have challenged you several times to name three Tonga people who have been fired without cause and you have failed. So when lungu ,Banda and their minions where running around the country like headless chickens campaigning on tribal lines did they think they were uniting the country. There is no bishop from SOUTHERN Province. He is preaching to the choir on tribalism. I thought a closed door meeting does not need to be exposed. Waste of time. U & yr PF are stinking tribalists. Very corrupt bishops one wonderwonder how such people with a questioned moral fibre can lead churches. The preacher man shaking his right hand while holding dirty money in the left hand.. The men in dresses, welcome to Zambia my home, my country, my pride. He entered State House on the back of TRIBALISM when it suited him and he never condemn it. A hypocrite always a hypocrite. Brown envelopes at work, just as FJT tried to woo them for a Third Term. My brothers who have sent various comments on this article, Please I beg you not to insults the Bishops who met our president. Have respect for them. God is watching you. Understand one thing each person on earth moves with an Angel who records what ever you do and what ever you say. If you think these Men of God went to state house for money, their Angels have recorded, BUT NEVER INSULT ANY ONE OF THEM YOU WILL BE ANSWERABLE BEFORE THE AUTHORIES IN HEAVEN. because you do not know exactly what they went to discuss with the President. Mwebena Zambia ala tuletinako fimo. Mona Mentor, can’t you see through Lungu’s pathetic maneuvers? Hypocrisy stands out prominently for even the mentally retarded to see. Zambians must learn not to accept mediocrity, and the guy operating from state house is extremely below par, unbelievably mediocre, and that’s not an insult but a statement of fact. When are you going to wake up to reality? Look, you have a long fingered (proven) drunkard in charge of your money and this man wants to be president again in 20121? Do you agree with that? Please wake up!! weather president Lungu is illegitimate or not deserves our respect and support because he is the leader of Zambia. Weather these bishops are corrupt or not they must be respected because they are leaders as well. HH , GBM, Edith Nawakwi and all other opposition leaders in the country must be respected. All of us will be judged by God in everything we do or not do. Please lets not call them names. They are our leaders . So only so called Bishops from North, East and Lusaka were invited by the drunkard to Lunch! How about Bishops from South, West, North West, Copperbelt? Even the drunkard knows those with weak morals that can support and bless his wicked morals and bigotry!! President Bozo, self imposed doing what he does best. Playing up to the gallery, the Zambians that buy into any rubbish that he throws at them..! DOES LUNGU NOT REALISE THAT THE DIVISION OF OUR COUNTRY COMES FROM THE MOUTHS OF HIS PARTY THE PF. NO AMOUNT OF PRAYERS OR CHURCH LEADERS WILL REMOVE THIS STING BUT ECL HIMSELF. SIR PUT YOUR HOUSE IN ORDER. THOSE OVER ZEALOUS HUNGRY CADRES YOU SURROUND YOURSELF WITH ARE YOUR DOWNFALL AND DOOM. IT S LIKE PRAYING TO GOD TO TAKE AWAY THE PAIN OF TOOTHACHE WHEN THE SOLUTION IS TO REMOVE THAT TOOTH.